Foundation Brings Sunshine & Joy . . . Helping Seniors & Disabled Individuals 7 Days a Week/365 Days a Year! The DGF Foundation is out in the field (regardless of the weather), helping seniors 7 days a week/365 days a year . . . ! Please join us as we celebrate our Founder’s 80th Birthday! We're raising $2,080 dollars in the next six (6) weeks (through January 31, 2018) for our Blanket Outreach Project. You can’t imagine how much comfort our warm, soft, and cuddly homemade fleece tie blankets bring to lonely seniors and disabled folks in care centers and rehab facilities! The David & Gloria Fissell Foundation is a tax-exempt 501(c)(3) charitable organization and Missouri nonprofit corporation, headquartered in St. Charles, Missouri. We are dedicated to helping nursing home and assisted living residents in St. Charles County, Missouri. We assist five (5) nursing homes/assisted living facilities comprised of approximately 520 residents; this includes mostly senior citizens and some disabled individuals. Our goal is to improve the lives of seniors and the disabled by providing things that they need (such as healthy food, warm, comfy blankets, socks, specialty pillows for medical and rehab needs, and personal care items—such as lip balm and hand lotions/creams), as well as things that will add enjoyment to their lives (such as large print books, magazines, crossword puzzles, word searches, coloring books, art supplies, playing cards, board games, movies, music, outings, and special events). Often the elderly and disabled have very limited income and mobility, and really appreciate even small things that many of us take for granted. Please see our article in the St. Louis Post-Dispatch, entitled "A wife's dying wish sends St. Charles man on a mission: David Fissell has started [a] foundation to help brighten [the] days of nursing home residents." Click here for details. The David & Gloria Fissell Foundation is a tax-exempt 501(c)(3) charitable organization and Missouri nonprofit corporation, headquartered in St. Charles, Missouri. Our foundation is dedicated to helping nursing home residents in need of assistance in the St. Charles County, Missouri area. Currently we are primarily assisting five (5) St. Charles County nursing homes/assisted living facilities comprised of approximately 520 residents; this includes mostly senior citizens and some disabled individuals. Our goal is to improve the lives of these individuals by providing things that they need (such as healthy food and personal care items), as well as some extras that will add enjoyment to their lives (such as large print books, magazines, crossword puzzles, and word searches, playing cards, board games, movies, music, outings, entertainment, and special events). Often nursing home residents have very limited income and really appreciate even small things that many of us take for granted. DGF has been expanding its mission! Our current focus is to provide the following items for nursing home residents in need: warm, comfy blankets, socks, reading material, crossword puzzles and word searches, fresh fruit, fruit cups, yummy snacks, favorite beverages, and a variety of baked goods and desserts. 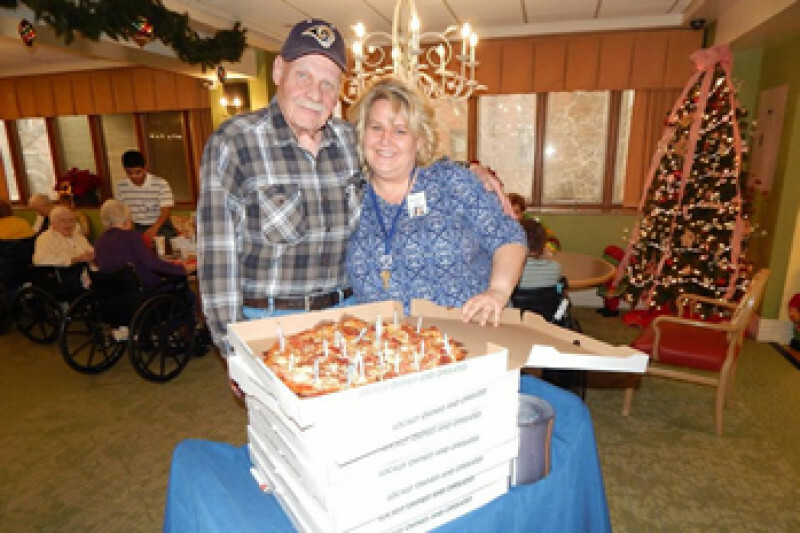 In addition, we are treating residents to special meals or snacks, such as pizza delivery and favorites from local food establishments, as we are able. Spending time with seniors and disabled individuals, as well as providing gifts and special prizes, helps these folks know that they still matter—and are truly cared about and NOT forgotten! Residents enjoy reading material, puzzles, word searches, card games, and good old-fashioned board games! Movies—including classics and personal favorites, as well as new releases—are a hit! In addition, seniors enjoy a wide variety of music, local entertainers, and special holiday and year-round events! We provide quarters, dollars, and prizes for bingo and are privileged to BLESS residents with haircuts, gift certificates, and birthday/holiday presents. It's our goal to add JOY to the lives of seniors and disabled individuals and put smiles on their faces—each and every day! About six to seven weeks before my wife, Gloria, passed away, she told me that she needed to have a serious talk with me. In a loving way, she said: "Let me talk and you just listen." You are here seven days a week, six to ten hours a day; I am so lucky! There are residents here who have a visitor once a month or less. When I die, what are you going to do with your time? I would like you to visit some nursing homes and help out in any way that you can. I said, "If that will make you happy and it's a wish of yours, I promise that I will." We sealed the deal with a hug and a kiss. She also said "You know I have some money stashed," and then told me where she had hidden $1,000 in our home. My wife passed away on July 26, 2014, which was about six weeks after our talk. In October, I was still grieving when a friend called to see how I was doing. I told him about the promise I had made to my wife. He politely suggested that I "get off my behind" and start honoring my promise! I went to two nursing homes and quickly realized that $1,000 would not last long. I decided to start a foundation so I could accept donations and soon met with both a CPA and attorney. I made my first donation to a local St. Charles, Missouri area grocery store known as Midtowne Market. Midtowne delivers to senior citizens who sometimes get behind on their grocery bills. I gave Midtowne a check for $200 and ask that it be used to help any senior who was in need. Since then, I've been helping nursing home residents, senior citizens, and disabled individuals in any way that I can, and have donated gift certificates, Christmas and birthday gifts, Easter packages, Mother's Day surprises, etc. I deliver fresh fruit and baked goods to nursing home residents multiple times a week. In addition, I provide quarters, dollars, and prizes for bingo, and cash for soft drink and snack machines. When nursing home residents are short on funds in any given month and need coffee, personal care items, or something else of importance, I do my best to provide it. I also run errands both for and with residents (such as to grocery stores and banks) and take some on outings to see friends. Many nursing home residents live on incredibly modest incomes and often have very limited amounts of cash available each month for little things that would bring them joy. It is my mission to bring a little JOY and SUNSHINE to these individuals—each and every day! Currently, DGF is focused on helping people in the St. Charles County, Missouri area. We hope to expand our assistance throughout the St. Louis metro area and to the Springfield, Missouri area (and beyond), as funds and volunteer efforts permit. Legal Information: The David & Gloria Fissell Foundation is a tax-exempt 501(c)(3) charitable organization and Missouri nonprofit corporation, headquartered in St. Charles, Missouri; our date of formation is March 11, 2016. The following individuals serve as our Board of Directors: David D. Fissell, President & Treasurer; Cynthia A. Rosado, Vice President; and Gina Arcobasso, Secretary. In order to continue to help these individuals, I need your support. Please consider donating to the DGF Foundation. Thank you very much; your donations are greatly appreciated! In spite of the oppressive summer heat, our DGF Care & Outreach Team is in the field 7 days a week helping seniors and disabled individuals in need! Please join us for an AWESOME Family FUN Bowling Event on Saturday, August 13th from 4:00 pm to 6:30 pm at Harvest Lanes in St. Peters, Missouri (4101 North St. Peters Parkway, St. Peters, MO 63304; 636/928-0788). The David & Gloria Fissell Foundation is a tax-exempt 501(c)(3) charitable organization and Missouri nonprofit corporation dedicated to helping nursing home residents in St. Charles County, Missouri. We help seniors and disabled individuals 7 days a week/365 days a year! 'Check out our Web site ( www.DGFcares.org) to learn more about our outreach in the St. Charles County community!!! You Don't Need a Reason to Help People--Start the New Year Right!! !